The Redistricting Game is a web site, designed by the University of Southern California Game Innovation Lab, designed to educate and empower citizens around the issue of legislative redistricting. Currently, legislatures themselves are authorized to redraw district boundaries, and this leads to abuses -- districts are drawn to protect incumbents and parties in power. The Redistricting Game allows citizens to see how the redistricting system works, and how it could be abused. It also provides information on reform efforts, including a playable version of the Tanner Reform bill, which would make the redistricting process more amenable to public needs. The Philadelphia chapter of Americans for Democratic Action (ADA) held a town hall forum on legislative redistricting at the sanctuary of First Unitarian Church, on Chestnut Street in Center City. DeWitt Brown, Chair of the Philadelphia ADA, welcomed the audience and introduced the panel -- Chris Satullo, News Director for WHYY; State Representatives Babette Josephs and Josh Shapiro; and City Councilmember Maria Quinones Sanchez. “In 2010,” said Brown, “the US will conduct its Census. The Census will (begin the process to) draw up everything from US congressional districts to Philadelphia’s councilmanic districts. To prevent the people who draw up the lines from disenfranchising another generation of voters, Philly ADA has convened this forum this evening to help raise the profile of this issue in preparation for the next round of” rewriting district boundaries. Brown also hope to address how voters could influence the redistricting process. 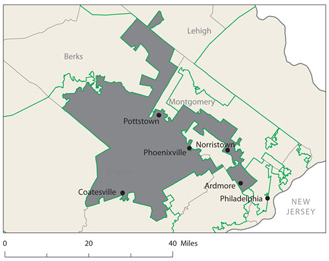 Pennsylvania's 18th district - Tim Murphy, R.
Satullo said that gerrymandering could undermine democracy in many ways: “It protects incumbents,” he said. “Our democracy doesn’t work well when incumbents know they can’t lose. When they can’t lose, they don’t need to compromise, and they don’t have to listen to different voices.” In drawing up legislative district boundaries, added Satullo, poorer municipalities and counties could be represented by several districts in the same county or city, so that legislators could ignore their problems without having to worry about being voted out of office. Minority areas, he added, could also be disenfranchised this way. The next speaker was Babette Josephs, who represents the 182nd Legislative District (which covers parts of Center City Philadelphia), and who is the Chairwoman of the State House’s Committee on Government, which oversees the redistricting process. “This is a great lot of people,” she told the audience, “to hear a very dry but very important topic. Pennsylvania's 6th district - Jim Gerlach, R.
Another issue Josephs has had to struggle with in the legislature is workplace discrimination: “I could not get out of committee, in the last session” she said, “a simple bill which would allow the Pennsylvania Human Relations Commission to investigate and vindicate people’s rights if they were discriminated against based on their sexual orientation or gender identity or expression. Nevertheless, said Josephs, “Representative Shapiro and I, and all the rest of the people who share our common values, are going to go back” to Harrisburg, to meet with other supporters of ending job discrimination against gay and lesbian people, and to continue to push for such legislation. New York's 28th district - Louise M. Slaughter, D.
Another advantage reforming the redistricting process, said Shapiro, is “It will better legislative results if we draw our districts in a more fair and less partisan way.” Most of the legislative districts in Pennsylvania, he said, are drawn with majorities of one party or another. “If you’re a legislator in one of those districts,” he added, “and you’re concerned with meeting the needs of your constituents, you tend to be very one-dimensional, in a partisan approach to a particular issue.” The opposing party in the district, he said, could be safely ignored. Maryland's 2nd district - Rep. Dutch Ruppersberger, D.
Meanwhile, at the joint meeting of the American Mathematical Society, the Mathematical Association of America, the Association of Symbolic Logic, the Association for Women in Mathematics, the National Association of Mathematicians and the Society for Industrial and Applied Mathematics held this year in Washington DC, Prof. Daniel H. Ullman of George Washington University organized a special session on the value and use of political redistricting algorithms. Other speakers Richard Pildes of New York University’s Law School, Micah Altman of Harvard University, of George Washington University organized a special session on the value and use of political redistricting algorithms. Other speakers Richard Pildes of New York University’s Law School, Micah Altman of Harvard University, Michael P. McDonald of George Mason University, Nathaniel Alfred Persily of Columbia University, James M. Snyder of the Massachusetts Institute of Technology, and Christopher P. Chambers and Alan D. Miller of the California Institute of Technology. In his coverage of the conference for d district' is," Wilson concluded. "Writing a formula for drawing districts requires us to define how funny-looking is too funny looking." Ullman described one school of thought on the question. "The idea is that circles are the best shape for districts," he said. "Unfortunately, they don't tessellate well." The January session was unique in that it brought together a large, diverse group of mathematicians to hear presentations by law professors, redistricting litigators, leading political scientists, and mathematicians who worked in a variety of fields including optimization theory, game theory, and statistics. It was one of the first times that mathematicians and redistricting practitioners had talked. Scientists & Engineers for America would like to continue this project and set a goal of positively influence redistricting by the time the 2010 census data becomes available in early 2011. The first targets of opportunity are the commissions and other bodies that have been established for independent redistricting in California and other states. Their next step is to publish expanded proceedings with support from the Russell Sage Foundation to serve as a base for further efforts over the next four to six months while they seek funding for the next stage, which could involve perfecting the mathematics, designing redistricting tools, and coming up with lay explanations for what they are doing.